Deep in the mountains of Austria, you will find the small town of Hallstatt. Besides the beauty of the city that located on the banks of the lake, you can also see the first salt mine in the world, enjoy skiing in the winter, and knowing the history of the era of iron and steel. Hallstatt, in the highlands of Austria is a small town in the Salzkammergut is located near Lake Hallstatter. The city is a popular tourist attraction because it can be enjoyed with just a walk for ten minutes. 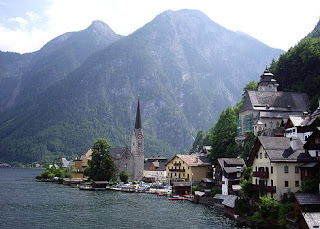 Although Hallstatt is a small town, but you can find several hotels and restaurants here. The city is also famous for its iron age culture which is a World Heritage Site. Salt is a valuable resource that makes the Hallstatt is historically very rich. Salt production takes place here since 1595 to be transported as far as 40 kilometers from Hallstatt to Ebensee salt water through the pipe. In this village, you will know that Hallstatt is home to the site of the world's oldest pipeline, which was built 400 years ago from 13,000 hollowed tree. This allows you to do a tour of the salt mine, located in the center of Hallstatt. Isolated landscape is also considered as one of the first places of human settlement as a rich source of natural salt, which has been mined for thousands of years. Some of the oldest archaeological objects were also found at Hallstatt, such as shoes Celt from 5500 BC. In addition, the blacksmith site (maker of wrought iron) was first excavated in the city. All highly developed culture that is possible from active trading and wealth that took place at around 800-400 BC Hallsatatt. Now the name of the city has been recognized around the world. Another place to visit in this small town is the chapel containing the bones of the local people that decorated with the owner's name, profession and date of death. Because they place a small cemetery, dug up the grave every ten years to move the bones to the ossuary. This was done to make room for new burials. Until the end of the 19th century, Hallstatt is only possible be attained by boat or through the narrow streets. Access between the houses on the banks of the river must also be reached by boat or on the road through a small corridor through the attic. The first path in Hallstatt was built in 1890 along the west coast. In addition to the wealth of salt, tourism now plays a major factor in the economic life of the city. 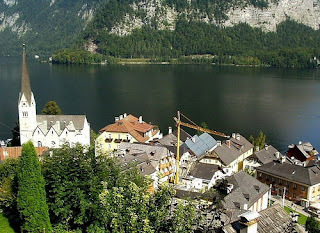 This makes the Hallstatt as one loaksi interesting to visit.